When faced with a business trip to New York, will Sam survive the trip with her boss Luke O’Donnell or will she discover more than she imagined? Will two clashing personalities discover they are in fact two halves, to one soul? After reading Home for Christmas by KM. 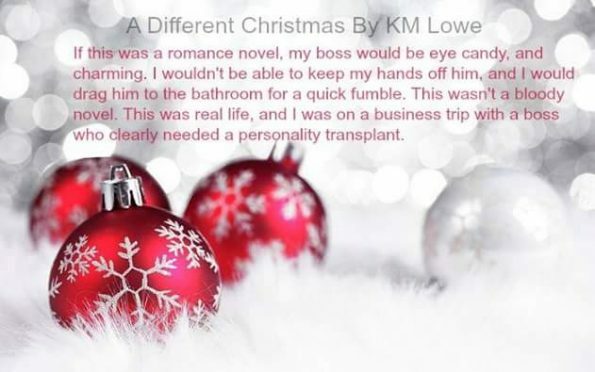 Lowe, I decided to indulge myself a little and one-click her other current Christmas novel, A Different Christmas, and I was not disappointed. This story blew me away. I was captivated and thrown straight in to this story from the very first chapter. Both Luke and Sam intrigued me, I wanted to know more about them, what made them tick, why Luke had insisted Sam took this trip to New York with him, what exactly was he up to? Sam was full of life, she wasn’t afraid to speak her mind or speak out for those around her. She was awesome, I really loved her character. Luke was a broody man, the kind of broody you wanted to delve into, to discover the real man behind the mask, and when you do, it’s instant love; you can’t not love him. He had a heart full of love to give, that had been tainted with his past, he just needed the right person to open it up, so he could show people, the real Luke O’Donnell. A Different Christmas has an array of characters, many you’ll absolutely love, and adore. There is more than one character in this story, I would love to know more about. However, there is one character I despised, if I could have crawled into my kindle and given them a piece of my mind, I would have. This story was everything and more. It brought about the true beauty of Christmas and the true meaning of love and family; the perfect festive story to feed my festive reading addiction.